August 7, 2016 August 7, 2016 Ann StephensLeave a Comment on OMG! A 19th Century File Cabinet! OMG! A 19th Century File Cabinet! The 19th century equivalent of a file cabinet! 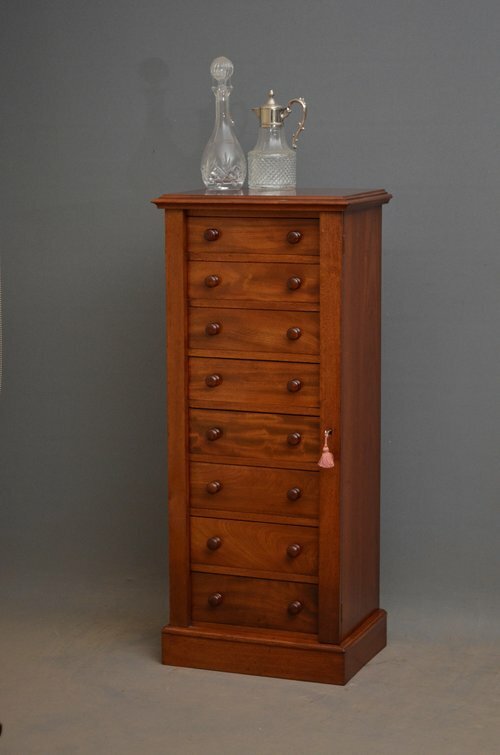 Pictured is a ‘Wellington chest’, sometimes called a ‘side-locking chest’. These got their name because the Duke of Welllington is supposed to have carried a similar chest with him on his Peninsular War campaigns. Wellington’s chest had to be portable, but it featured a frame on the right-hand side that overlapped the drawer fronts. This strip of wood, when locked in place, prevented the drawers from opening. It was the latest security tech for that era. After the war, anyone who needed private and secure storage seized on these useful items. Surviving pieces average around four to four-and-a-half feet tall, with seven to ten drawers. Wellington chests were made into the Edwardian era, and are still found by lucky antique hunters today. I’ve given a Wellington chest to the factory-owner-turned-earl hero of my current Work-In-Progress. Would you like to have one of them for yourself, or stick to the plain metal models we’re familiar with today? A full article about this particular Wellington chest is here.